Making automated and/or repetitive changes to tune files can be accomplished using a script file. The first beta release of scripting within V8 Scan and Tune releases a small subset of what will eventually be comprehensive scripting support. Managed in the newly created [F3: Tune] ->[F9: Scripting] screen, this initial release allows users to create scripts to read tune file and controller information, as well as modify items including comments, history, tune file security settings and remote settings. Future releases will include the scripting of reading/modifying calibration data. The Lua scripting language and runtime interpreter is used by the EFILive V8 software to implement scripting. 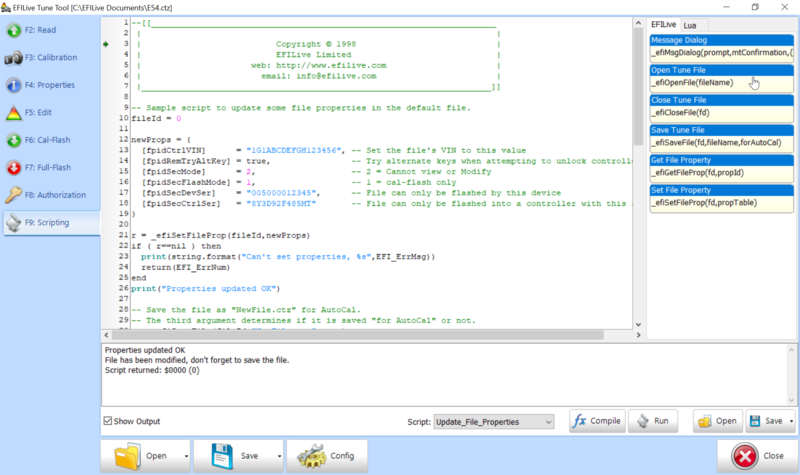 A range of example scripts are included in the \Documents\EFILive\V8\Scripts folder. Users now have beta access to use example scripts or create their own. Scripts can then be applied to open tune files by using the [Run] function, or can be saved for later use and applied via the EFILive Command Line Interface. User feedback drives innovation; EFILive invites customers to provide feedback on scripting and offer suggestions for further inclusions. Basic documentation is included in EFILive Command Line Reference.pdf, and additional documentation will be added to the V8 Reference guide shortly.